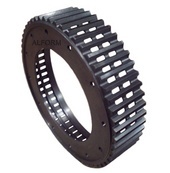 Gears from Alform today are part of a large variety of applications. Be it as a worm shaft in the convertible roof of a cabriolet or as a 1000 kg spur gear in a conveyor system or in a ship's engine. 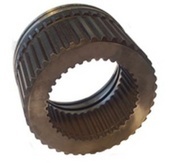 When quality is needed, our worldwide customers prefer to resort to our decade-long experience in the gearing process. Download PDF-Prospectus: ALFORM_Gear cutting customer-specific.pdf Send your inquiry with your drawing to sales@alform.de! 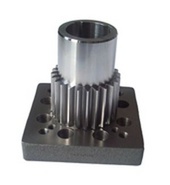 We process case hardening steel, tempered steel, nitrided steel, construction steel, aluminium, bronze, various cast alloys and plastic for CNC-turning and milling, hobbing, gear shaping, broaching, hard machining, tooth flank grinding, lapping, external and internal cylindrical grinding depending on material and your application. Required heat treatments such as case hardening, long term / short term gas nitriding, plasma nitriding (ion nitriding), inductive heating, tempering or coating we let execute by specialized ISO 16949 - certified partners. The tooth flanks are milled, shaved or ground according to the customer's specifications. Thus we can meet also your higher demands about gear quality. Because of our many years of experience we have the know-how to ensure, depending on the component, a gearing quality of up to 4 acc. permanently and in documented manner. Between the diameters Ø 250- 1200 mm we can also grind respectively mill the internal gears straightly or in helical manner. 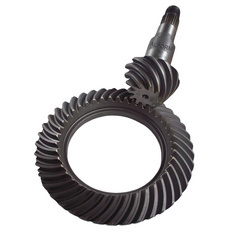 For internal gears in this range of diameters we can guarantee a constant gear quality of 4 with documents. Tooth flanks can be milled or lapped. 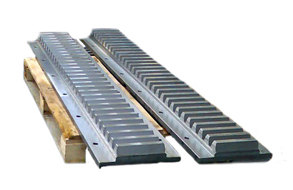 Up to max: width 600 mm x length: 4000 mm, module up to 25. Torques up to 10,000,000 Nm (10,000 kNm). Bore diameters up to 1200mm both for merchandise ordered by catalogue as for customer-specific parts. 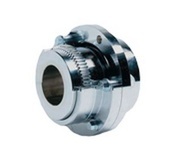 Test us with toothed couplings, combining our quality with fair prices! 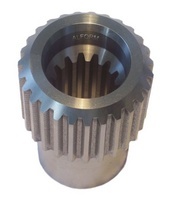 ALFORM delivers also standard gears beginning with small series according to our standard catalogue. 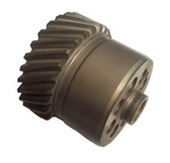 Please download our catalogues for standard gears and send your inquiry to sales@alform.de!